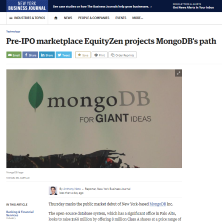 Thursday marks the public market debut of New York-based MongoDB Inc. The open-source database system, which has a significant office in Palo Alto, looks to raise $168 million by offering 8 million Class A shares at a price range of $20 to $22. That’s up from a previous range of $18 to $20. So far, analysts place the price at $21 per share. That’s according to EquityZen, a four-year-old New York company operating a secondary marketplace for company approved transactions in pre-IPO stock.